VISA Cards are accepted worldwide, making life easy for you! Our cards are a great way to start building credit whether you are young or old! 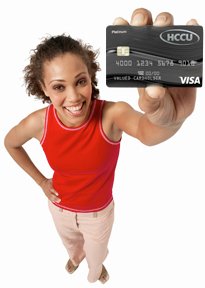 To view our VISA Credit Card Rates, Fees, and Disclosures, please click here. The VISA Credit Card Application will need to be downloaded, printed, and then mailed, faxed, or brought in to a branch. Manage Your HCCU VISA Credit Card online by clicking here. All Visa Payments should be mailed to 1424 Walton Way, Augusta GA 30901. If you have electronic payments setup to pay your credit card, please make sure this address is also used in your electronic billing platform. Credit Life / Disability, by adding it to your loan you are protecting your credit and your family. If you become disabled, this insurance will make your payments for you. The life insurance will pay off your loan up to $50,000.